What is Fraxel® Dual Laser Resurfacing? At BAXT CosMedical® we offer a variety of laser and light source technologies to address skin damage and renew your face to a more youthful appearance. One of our patients’ preferred facial rejuvenation procedures is Fraxel® Dual Laser Resurfacing. This advanced device offers our patients the benefits of fractional laser resurfacing. Fraxel® works by creating tiny microtrauma underneath the surface of the skin, and then as the body heals those sites, new collagen grows. Fraxel® Dual has two wavelengths, and it works well for reducing hyper-pigmentation/sun damage, as well as treating scarring (including acne scarring), fine lines, and wrinkles. Fraxel® has been available for more than a decade and cosmetic physicians have treated hundreds of thousands patients worldwide. Fraxel® is a non-invasive and clinically proven safe technology for facial skin resurfacing. *Actual patients. Results may vary and are not guaranteed. Fraxel® works very well for patients with these conditions. Fraxel® also helps improve the appearance of sun damaged skin on the chest, neck, and hands, and other body areas. We can treat any skin type or color with the Fraxel® Laser*. When you have a Fraxel® Laser Treatment, you will be in the office for approximately 2 hours. At BAXT CosMedical® our dermatologists have a special numbing cream and icing protocol that makes the Fraxel® Laser procedure very tolerable. This topical cream plus directing cool air towards the patient’s face helps to make our Fraxel® Laser Resurfacing patient more comfortable. This facial preparation protocol takes about one hour*. The next step is to carefully direct the Fraxel® Laser to the patient’s skin in microscopic laser spots, to minimize the downtime. The laser procedure takes about 10 minutes, and then you will ice afterwards*. You can expect to have a few days of a “sun burnt” look and feel to your skin, and then some bronzing and peeling afterward. ​Fraxel® Laser Resurfacing causes redness and swelling which can last a few days. Afterwards you can expect the treated skin to be rough or a little dry and flaky or peeling. 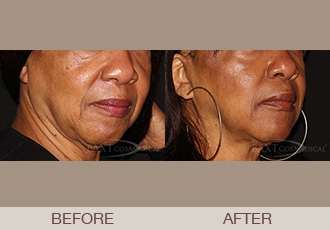 This is a normal part of the Fraxel® Laser Resurfacing treatment process. How Many Fraxel® Dual Laser Resurfacing Treatments Are Needed? Because Fraxel® is “fractionated” resurfacing it only does a percentage of the skin at a time. This is why Fraxel® is so safe but it does take more than one treatment. Dr. Rebecca Baxt and Dr. Saida Baxt typically recommend 3-5 spaced approximately one month apart each time for optimal results*. What Results Can I Expect From My Fraxel® Dual Laser Resurfacing Treatment? You may see results after one treatment and more results each time you have a Fraxel® treatment*. Patients notice improvements in skin tone, texture, and pore size. Fraxel® treatments effectively removes brown spots, smooth acne scars, decreases wrinkles and it can also be used on the neck, chest, hands, and other body areas. Fraxel® makes noticeable and lasting changes in the skin*. However we are all still aging and we lose collagen as we age which is why acne scarring and fine lines and wrinkles look worse over time. We recommend once per year maintenance for most of our patients. “As a patient of Dr. Saida Baxt & Dr. Rebecca Baxt, I must say that I love them both. They are both such warm, genuine people that truly care about their patients. And it is because of their hard work that my skin looks great now.” A.S. The skill and experience of an experienced board certified dermatologist is important in order to produce natural-looking results that will rejuvenate the skin of the face and body. ​Dr. Rebecca ​Baxt​ and ​Dr. Saida Baxt​ have years of experience and are skilled in laser technology. ​Contact us​ today to see if you are a candidate for Fraxel® Dual Laser Resurfacing.